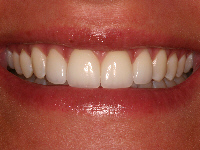 To place these four porcelain veneers a small amount of tooth structure was removed from the four front teeth. The two front teeth were too wide and needed to be narrowed and only the four front teeth were veneered. This case was completed in two visits. 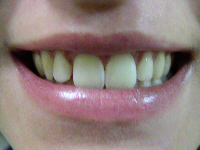 The patient had a set of temporary veneers placed until the final ones could be delivered. Cosmetic Dentistry can change the face in dramatic ways; make the person look younger, more mature, look smarter and brighter.